I'm not only going to put items for sale on here - honest! It's just that I had things ready. These three scarves were made from some yarn I picked up cheap at a charity shop. If you get the impression that I frequent charity shops, well you are quite correct! 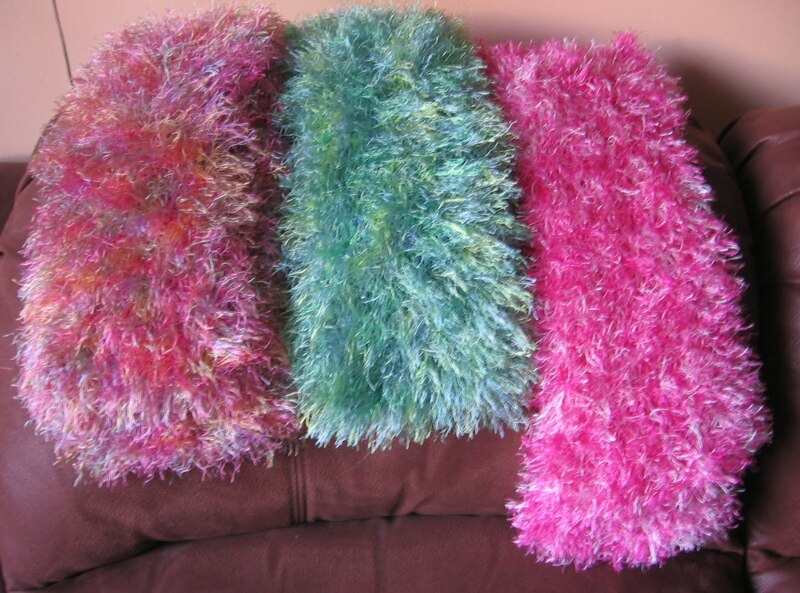 These scarves were knitted with 10mm needles and are nice and light and fluffy. The pink one is knitted from a different brand of yarn from the other two (can't remember what any of them were!) and is a bit longer at about 38". It is quite difficult to measure them as, because they are so loosely knit, they stretch a lot. The others are about 34" - long enough to wrap round your neck and cross over on your chest, but not to have long dangly ends. I would want £3.00 for each one or £8.00 for all three. See note to the side about P&P. If you wanted one like these in a particular colour or one similar to these when they have gone, I would probably have to pay full price for the yarn, so would charge commensurately more. I have started another scarf in another fluffy yarn, but it is shedding fibres all over the place as I knit, so I'm not sure whether it will end up here or not. It has sparkly bits in so is quite fun. I'll see how it is when I've finished it and washed it. I am aiming to blog at least once a week and not only with sale items! Thanks so much for dropping by both my blogs ... yes I have done some of the same for Petes family. If you can face going back on my G the P blog (click on older post) you will see several of his mother, grandmother and one of his great grandfather who was in the Civil War.